Location: About 5 kilometers away from the Yumen Pass, in the North of Dunhuang City, Gansu Province. There are buses to Nanhu County from the Dunhuang City Passenger Transport Station. You can also hire a private car. Since it is a large attraction, you’d better take a battery car to get into it when you arrived. The Han Dynasty (202 BC - 220 AD) Extends of Great Wall is the most special section. With over 2000 years’ erosion of wind and rain, as well as the damage of quicksand, parts of it razed but most of it are still well preserved. 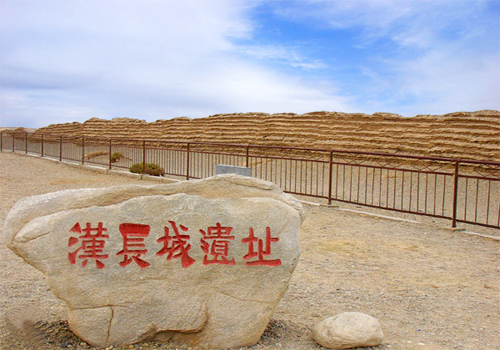 Those extends of Great Wall in the west of Yumen Pass are best preserved with the base length 3 meters, hight 3 meters, and top width one meter. The majestic Great Wall is a miracle created by China’s ancient people. 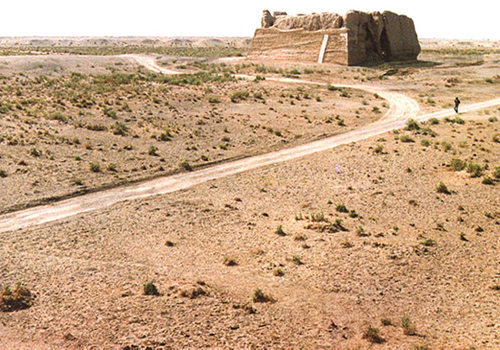 The Han Dynasty Great Wall Extends was built by the central government of Western Han Dynasty (206 BC - 24 AD) to strengthen frontier defence and further cement centralization, and to develop trade and friendly communications with Central Asia and West Asia countries. After three years of civil war in 206 BC the first Han Dynasty was formed under the Gao Di Emperor, Liu Bang. At first he attempted to appease the northern invaders with gifts and increased trade but peace was sporadic. A massive force of the Han army attacked the invaders and forced them back across the northern borders. To consolidate their victories they began to mark out their new extended borders. In many areas they simply restored the old Qin wall. In order to build walls in the desert of the west, new methods of construction had to be devised. Here the soil consists of a gravel of sand and small stones. They used alternating layers of red willows and the gravel and lots of tamping. This produced a wall that has survived for some 2,000 years. 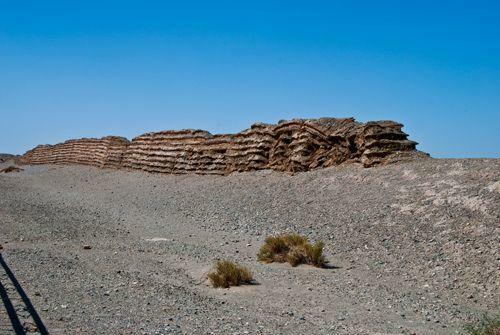 Using these techniques and hundreds of thousands of people, the Han were able to build the wall far into the Gobi desert. And where clay was used as a skin or coating it made the wall difficult to scale and protected it against the erosion of the weather. The Han leadership knew to have a strong frontier they not only needed to build a strong wall but they also needed crack troops to defend it. They developed a force of light cavalry that could foray into the enemy territory to check on the enemy movements in his own grounds. They had many victories against the Xiongnu. They then employed renegade Xiongnu horse masters to set up horse breeding stables and to train their troops in horsemanship. 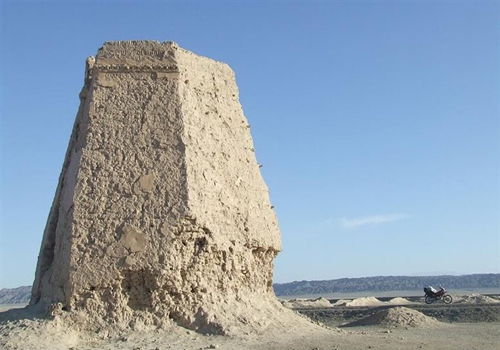 By the time of the sixth Han Emperor Wu Di some 66 years later, they had crushed the Xiongnu and the wall was extended some 300 miles into the Gobi Desert. There is no brick or rock in the construction of Han Dynasty Great Wall. 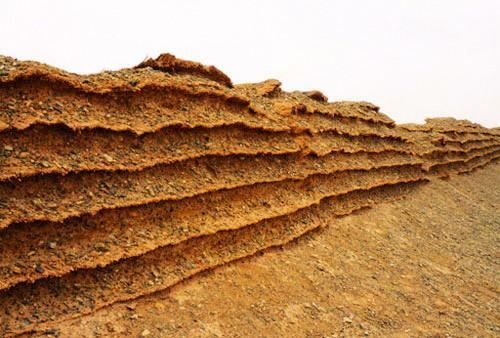 Since large areas of rose willows, reeds, bluish dogbanes, poplars grew in the local place, the ancient people collected the branches as the foundation, and put some soils and sands above, layer by layer, built the Han Dynasty Great Wall. They put some silver sand on the bottom lands to record enemy’s footprints. It was a defensive measure. Along the Great Wall, there is a beacon tower in every ten miles. It was used to supervise and deliver information, as well as offer supplement for the messengers or trade caravans of the Silk Road. Several soldiers guarded the tower, and would send smoke signals from the tower as alarm when they found enemy troops approaching. Many precious historic relics were kept by the Han Dynasty Great Wall Extends and the Beacon Tower. They provided important information for the study of China’s ancient politic, military, economy, and culture. Besides, they are also interesting tourism resource of China tours, favored by many foreign tourists.